In their first World Series appearance, the Cardinals, led by player-manager Rogers Hornsby, edged the Yankees in seven games. The series is remembered for the bases loaded duel in game 7 between the Veteran 39-year-old righthander Grover Cleveland Alexander, obtained by the Cards in a midseason trade with the Cubs, and the young 22-year-old Yankee 2nd baseman Tony Lazzeri. Both players ended up in Cooperstown. Alexander prevailed and enjoyed his finest moment, and that’s saying something. He had pitched complete game victories in Games 2 and 6 before coming into the seventh inning of Game 7 with no rest, after starter Jesse Haines developed a blister. The Cardinals were up 3-2 but the bases were loaded with two outs. Facing Yankee rookie slugger Tony Lazzeri, Alexander got him to strike out and then held the Yankees scoreless for two more innings to preserve the win and give St. Louis the championship, upsetting the powerful Murderers’ Row lineup. The game featured 9 Hall of Famers: Rogers Hornsby, Jim Bottomly and Alexander on the Cardinals side and Earle Combs, Babe Ruth, Lou Gerhig, Herb Pennock, Tony Lazzeri and Waite Hoyt on the Yankees side. A side note: Cardinals third baseman Les Bell was born, raised and buried in Harrisburg, Pennsylvania. 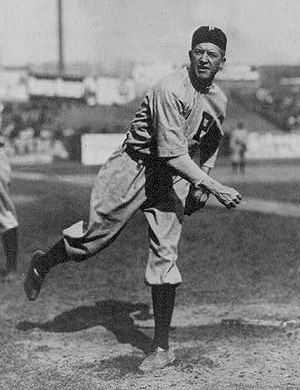 Grover Cleveland Alexander set the league on fire in his 1911 debut, leading the league with 28 wins (a modern-day rookie record), 31 complete games, 367 innings pitched, and seven shutouts while finishing second in strikeouts and fourth in ERA. The best, however, was yet to come. Alexander was the dominant pitcher in the National League from 1915 to 1917, becoming the only pitcher to win pitching’s Triple Crown three years in a row, and from 1912 to 1920, Alexander led the league in ERA four times (1915, 1916, 1919, 1920), wins five times (1914-17, 1920), innings six times (1912, 1914-17, 1920), strikeouts six times (1912, 1914-1917, 1920), complete games five times (1914-1917, 1920), and shutouts six times (1913, 1915, 1916 [a single season record 16], 1917, 1919). In 1915, he was instrumental in leading the Phillies to their first pennant, and he also pitched a record four one-hitters. After the 1917 season, the Phillies sold Alexander to the Cubs, fearful that he would be lost to the army in World War I. Sure enough, he was drafted, and spent most of the 1918 season in as an artillery officer, where he suffered from shell shock, partial hearing loss, and increasingly worse seizures. Always a drinker, Alexander hit the bottle particularly hard after the war. He still gave Chicago several successful years, however, and grabbed another pitching triple crown in 1920. Finally tiring of his increasing drunkenness and insubordination, the Cubs sold him to the Cardinals in the middle of the 1926 season for the waiver price. Alexander’s 373 wins and 90 shutouts are both National League records, and he is also third all time in wins, tenth in innings pitched (5190), second in shutouts, and eighth in hits allowed (4868). In 1999, he ranked number 12 on The Sporting News’ list of the 100 Greatest Baseball Players, and was a nominee for the Major League Baseball All-Century Team. Tony Lazzeri, a second baseman, entered the major leagues in 1926 as a member of the New York Yankees. In his rookie season he posted a .275 batting average with 18 home runs and 114 RBI, impressive numbers which would become his annual trend. As a member of the Yankees until 1937, he averaged 79 runs, 14 home runs, 96 RBI and 12 stolen bases including seven seasons with over 100 RBI and five seasons batting .300 or higher (including a high of .354 in 1929). During this time the Yankees won six American League pennants (1926, 1927, 1928, 1932, 1936 and 1937) and five World Series championships (1927, 1928, 1932, 1936 and 1937). Lazzeri holds the American League record for most RBI in a game with 11, set May 24, 1936. That same day he became the first major league player to hit two grand slams in one game. Tony Lazzeri was selected to the Baseball Hall of Fame in 1991.